Many thanks to the MCCBD creators Mia and Valarie for including The Latina Book Club in their lineup. I love chocolate milk. In fact, every Wednesday it is my ritual to visit my local Farmer’s Market and buy a pint of chocolate milk from the Ronnybrook Farm. It is so rich and creamy. It’s like drinking a chocolate bar. I also love making hot chocolate by melting pieces of a Cortés Sweet Chocolate Bar in Carnation evaporated milk. Yum. Hence, I was very pleased to receive a copy of CHOCOLATE MILK, POR FAVOR! by Maria Dismondy to review for Multicultural Children’s Book Day, January 27. It is a beautiful and touching story of inclusion, diversity and empathy. As Maria Dismondy puts it: “It is about how actions speak louder than words!” Children of all ages will enjoy this wonderfully written and illustrated book. 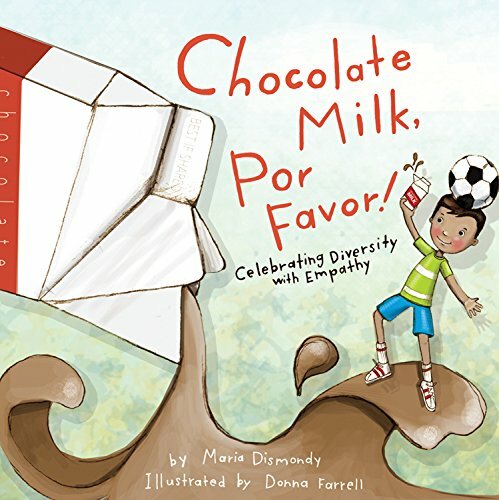 ABOUT THE AUTHOR: Maria Dismondy is an award-winning author, specializing in books about challenges children face. A topic close to her heart, Maria’s own childhood experience inspired her first book, SPAGHETTI IN A HOT DOG BUN. Her dedication to empowering children with courage and confidence has reached new heights, touching the hearts and hand of children the world over. As a sought-after speaker, Maria spreads her message by presenting at schools and conferences across the country. She holds degrees in education and child development. Maria lives in southeastern Michigan with her husband and three book-loving children. Visit her at http://mariadismondy.com/. MISSION: Multicultural Children’s Book Day’s mission is to not only raise awareness for the kid’s books that celebrate diversity, but to get more of these books into classrooms and libraries. CREATORS: The co-creators of this unique event are Mia Wenjen from Pragmatic Mom and Valarie Budayr from Jump Into a Book/Audrey Press. You can find a bio for these dynamic ladies here. BOOK LISTS & RESOURCES: The MCCBD Diversity Book Lists and Resources for Educators and Parents are available by clicking here. READING CHALLENGE: The Classroom Reading Challenge has begun! Teachers can earn a free diversity book by clicking here.